So we bade goodbye to Sarahan and wound our way downhill past apple orchards, past slate roofed brightly painted houses, past fields of paddy – the lush green giving way to olive and finally dull brown as we descended. 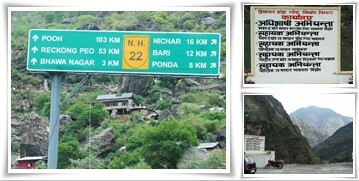 At Badhal, 4 km from Jeori, Kakuji stopped at Gyan Chand Ki Dhaba for grub. Though we had already had breakfast, we couldn’t help bolting mouthfuls of scrumptious Kadhi Chawal and Rajma Rice mixed with fiery red chilies. A short stop at Tarandamata Mandir for the mandatory divine benediction (Public toilets a short way from the Mandir was an even greater blessing) and we were bouncing along the road hewn through cliff faces that looked like bared fangs of a demon. At Bhabanagar, our search for the PWD office where we could get a permit to stay at their guesthouse in Chitkul proved futile (We located the place during our return lap). Further down, we plodded through rubble and suffocating dust trails of trucks and tipper lorries near the Karcham dam site over an NH-22 that had disintegrated into potholes interspersed with short, relatively painless stretches of asphalt. The tossing and turning and jangling and rattling ceased only after Tapri. Breathtaking scenery unfurled – tiny hamlets precariously poised on mountain flanks, snow covered summits far and beyond, mountain goats tumbling down steep slopes… At the tiny Sharda Mandir that seemed attached to the cliff edge with an adhesive, an English speaking Pujari applied vermillion streaks on our foreheads and distributed delicious “Prasad” of dry fruits and sugar balls. Down below, a ferocious and frothy Baspa river gushed over enormous boulders, in a menacingly deep gorge. 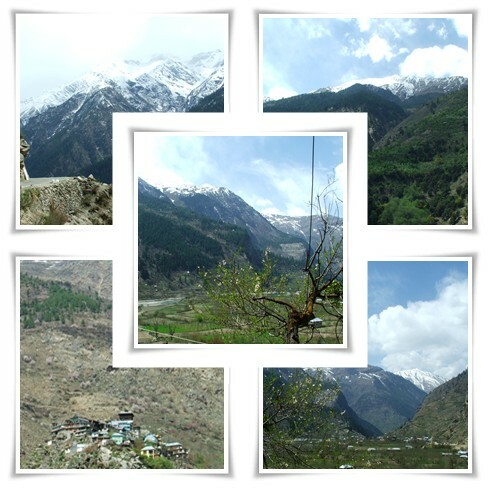 Beyond Kuppa, Sangla valley lay threadbare under a vaulting silver blue sky, gashed in the middle by the silver streak of Baspa river, encircled by snow clad mountain peaks and dribbling glaciers. The town was fairly big with quite a few hotels and boarding houses around. 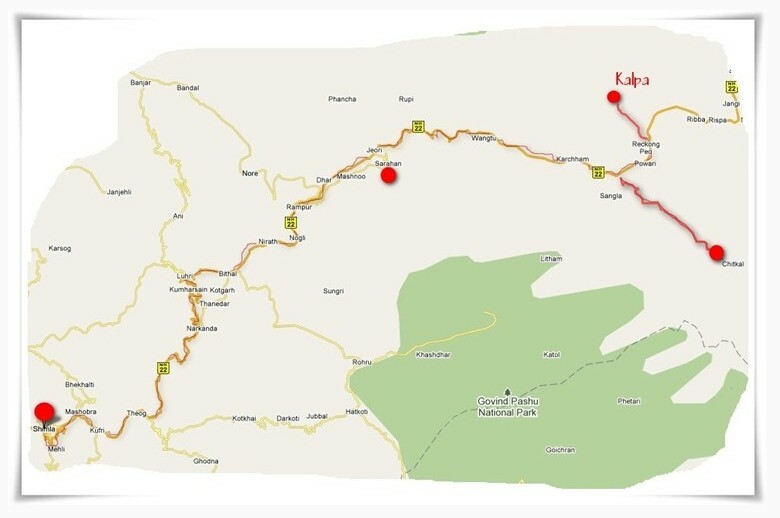 Several camps could be seen beside the river. As we climbed up from the valley, the road narrowed, barely wide enough to accommodate two cars at some sections. Ragged, steel grey rock faces rose up like gothic cathedrals to our left, at once disturbing and fascinating. Colossal boulders, fissured massifs and twisted trees bordered the pulverized road evoking images of a celestial battle, an Armageddon that wrecked the landscape. Pale pink flowers of Chuli trees that dotted the scene were the sole aesthetic relief in this rugged terrain. As we drove further, the snow crept silently closer; muddy and slushy, it reposed under stones, over thorny bushes, near tree roots. We passed Rakcham, a small village of wood, stone and shale houses that lined the road. The mountains suddenly gave out revealing a vast mauve coloured steppe, piled with boulders and partitioned haphazardly by stone walls. An old man, bent double over a gigantic stack of firewood teetered beside the road. We turned a corner and came to an sudden halt. 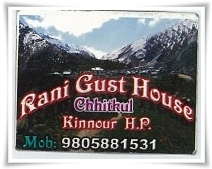 Chitkul!!! The abruptness of the arrival left us disoriented. For a while we did not know where to go, what to do. There was the PWD guesthouse on our left. 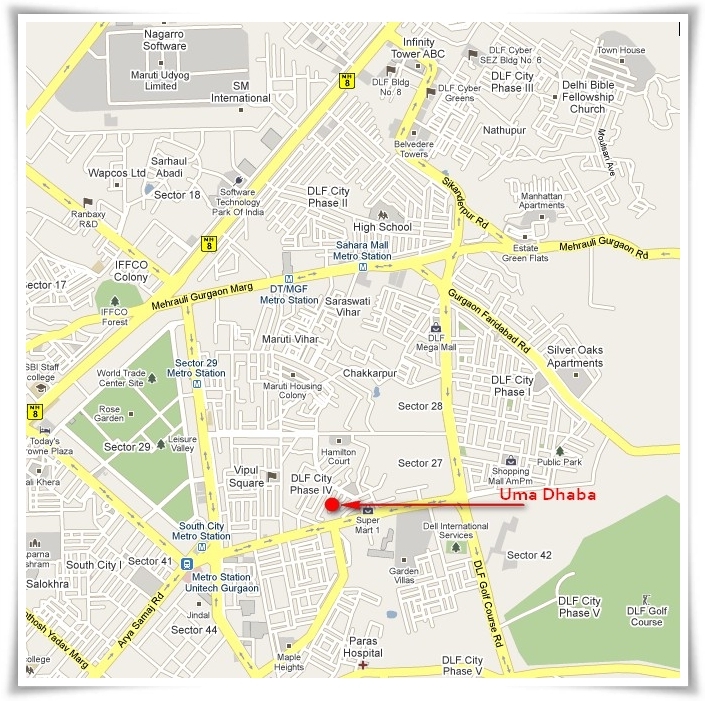 On the right, in a ditch was the famous “Hindustan Ka Aakhiri Dhaba”. A rabble of concrete buildings still under construction furnished the front view against a backdrop of majestic snow cloaked mountains. On to the right, across the river, pines drooped under the weight of accumulated snow. It was knuckle whitening cold. Having eaten nothing for the past four hours, we were terribly hungry. We also needed a place to pee. A ragged crowd that wandered about ignored us pointedly. 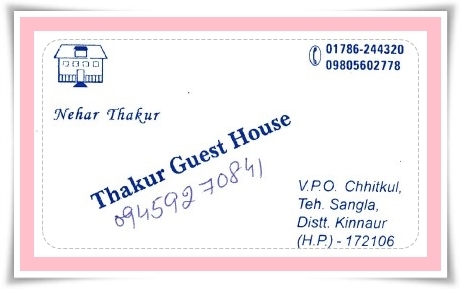 The PWD guesthouse caretaker agreed to put us up, but later changed tack. But he allowed us to use the washroom for which we had to fetch water for ourselves in a bucket. Later he served us the most repulsive Dal-Rice we ever had – coagulated, glutinous rice generously sprinkled with human hair and sand grains. I still wonder if these ingredients were added for taste or to avenge a vendetta of some former incarnation. The snowfall of the previous day had frozen up pipelines and running water was not available. None of the guesthouses were therefore willing to put us up. Finally, to our immense relief, Rani Guesthouse agreed to accommodate us in a dingy room. We bought some biscuits and snacks at the lone general store in the village, run by a sweet lady with a baby saddled to her back, and went for a walk near the river. A thick blanket of snow covered the river bank. The water was clear as crystal but freezing cold. I dipped my hand inside and spent the next half an hour furiously rubbing my numb fingers and palm. Really scary. There was no motor able road beyond Chitkul. It was a true frontier village. A narrow dust trail escaped the village and threaded its way across the lunarscape into the white desolation of snow clad mountains, bound for the police post three kilometer ahead. We walked along the trail and wandered about a bit before returning to the village. Snot-nosed children accosted us peering over the camera and occasionally posing. A few village women greeted us with smiles that transformed brilliantly their deeply furrowed, ascetic faces. We retired to bed early after dinner. The village lay enveloped in darkness with a handful of incandescent lights glowing like fireflies here and there. Through the window the faint iridescence of snow on the mountains was visible as we lay in bed. The blankets were fetid and musty, making me afraid of catching some skin disease. 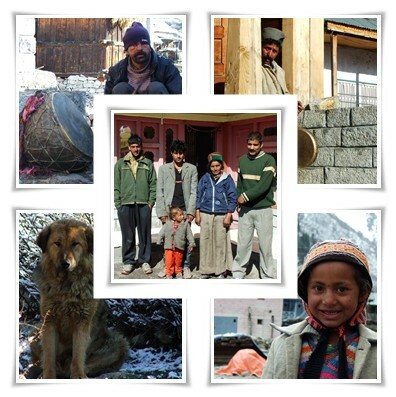 But we felt really thankful to our generous hosts for the shelter and were soon immersed in deep, dreamless sleep. It had snowed during the night. When we woke early next morning, the landscape had taken on an ethereal aspect – snow lay everywhere, on the roof, over tables, on chairs, softening everything, obliterating all features in an all encompassing whiteness. The sun came out, torching the smoking peaks in orange flames. With sun came a freezing wind that blew snow flakes from branches and howled through the streets. It made us shiver and clutch our jackets tight as we walked about. Snow clung adamantly on firewood, thorny bushes and barbed wire fences. People were sweeping it off their roofs. Snow melt dripped from gables. A shaggy dog took a fancy on us and followed us around taking considerable pleasure in the occasional cuddles and strokes that we bestowed. The fields were being prepared for sowing. In the months after winter the people cultivated Aloo, Matar, Joh, Bhapra and Olga and stored the harvested grains in Kuthars (storage houses) for winter. Our hosts were unpretentious as they were gracious. We wandered into the kitchen and watched them prepare breakfast and tea. The language they spoke was Kinnauri, but we could easily get by with Hindi. Very few people stayed in the village during winter. Those who stayed back in the wooden houses lined inside with mud hardly ventured out. One could easily catch pneumonia and die. Life was not as idyllic as we made out. 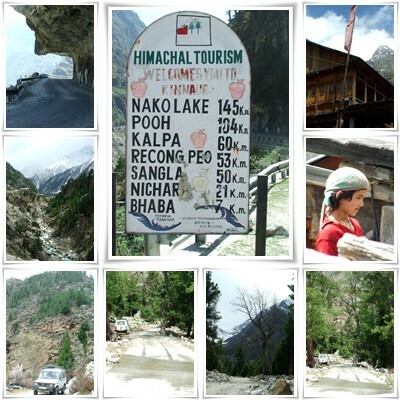 But tourism was picking up providing much needed money and some alleviation to hardship. 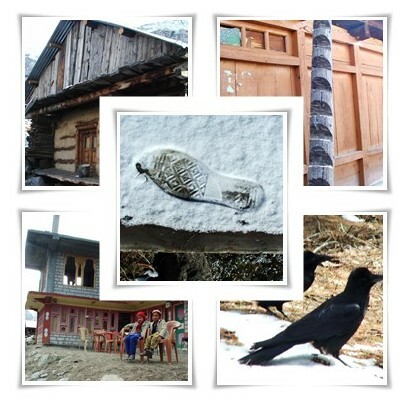 Taking leave of Chitkul was extremely hard. There it was; recumbent in splendid isolation, cocooned from outside world untill recently; an island in the stream. But change was coming and coming fast. I looked back one last time, sweeping hungry eyes over the mountains, the valley, the wooden houses and a shabby brown donkey that rambled about and hoped against hope that change didn’t inflict irreparable damages to the land and the people; that Chitkul will forever remain stranded in time, retaining its innocence and Spartan charm. 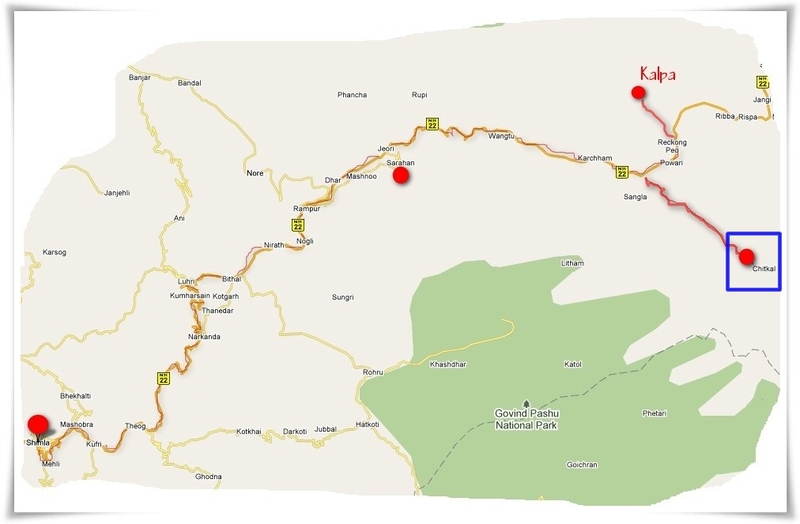 Note: The road beyond Bhabanagar, from Natpha Dam site to Wangtoo, Karcham till a few miles beyond Tapri is in pretty bad condition due to the Karcham-Wangtoo Hydroelectric project construction. Total 8 rooms. 4 rooms with attached bathrooms. Hot water available. Part I – Black Goddess, Pink Blossoms, Yogurt Mountain!!! The best things in life mostly occur by chance. Take the case of having a child. You never intended it, but it just happened so and you are so much happier for it. At least, for a while. I was never a great believer in chance. Always used to plan, plan and plan. But this journey undertaken solely on the whim; this journey without maps; it made me a lifelong admirer of chance. We had booked train tickets to Jammu which didn’t get confirmed till the last moment. The prospect of spending 3 idle days in Gurgaon was horrifying. The situation had to be salvaged, somehow. And the route to salvation, as always was Google. 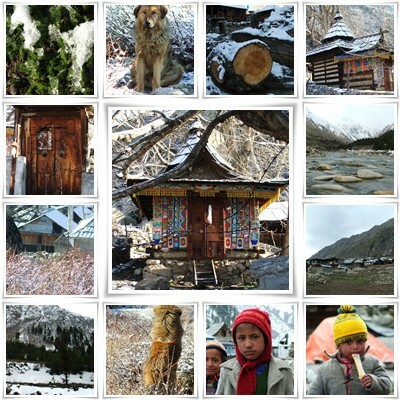 We found a blog (www.bushahrtimes.com) which described Chitkul as this outlandish, mesmerizing outpost, somewhere on the Indo-Tibetan border. That was it. That was exactly where we wanted to go. 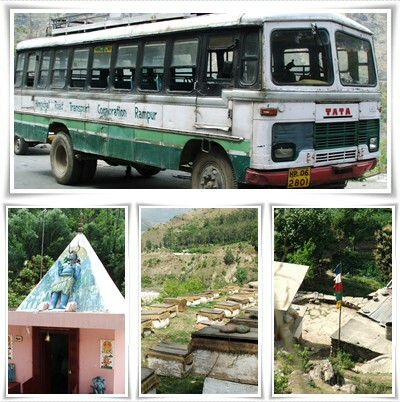 So we packed our bags and through a friend managed two seats on the Delhi-Shimla Volvo bus run by HPTDC. A chance meeting with Dharmender, our bus conductor, at HPTDC office in Janpath Road helped to fix our transport from Shimla to Chitkul. It was as if a benevolent God had ordained it. Verily, Divinum Mysterium. 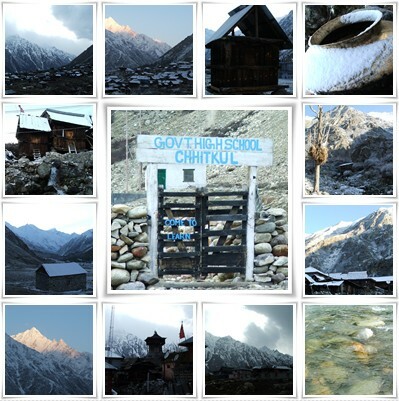 Well, once we got going, Chitkul became just another destination on the itinerary. Our journey assumed a life of its own and took us to places we had never heard about. It would be overwhelmingly tedious if I narrated it all at one go. 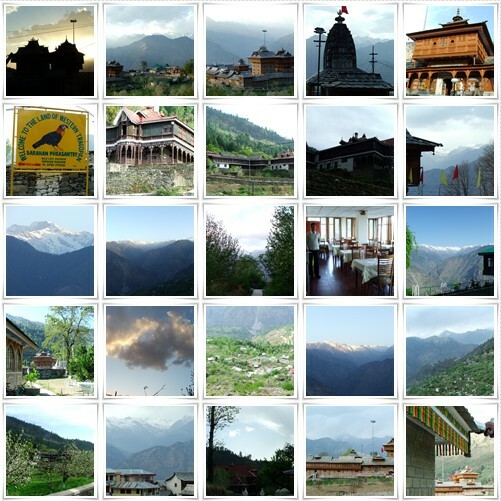 So let me divide the post into four parts, based on the four places we spent the night – Sarahan, Chitkul, Kalpa and Shimla. 6 AM, the bus deposited us at Shimla. Our laconic driver, Kakuji alias Suresh was already waiting at the bus stop with his rickety Tata Sumo. For the next couple of hours we rattled through winding roads criss crossed with shadows of deodar and pine trees, shafted in the eye by a mercilessly bright sun. 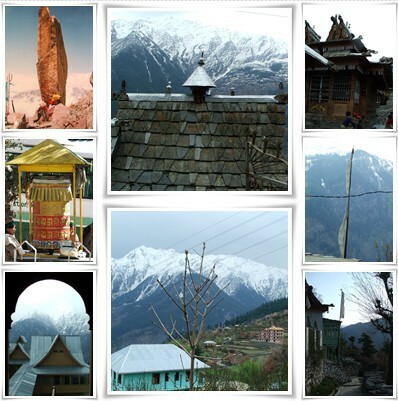 We passed several quaint towns perched on the hillsides – Sanjoli, Kufri, Fagu, Theog, Matiana – before reaching Narkanda where we halted for breakfast. An impromptu discussion over Aloo Parantha and hot tea produced sort of a sketchy itinerary. 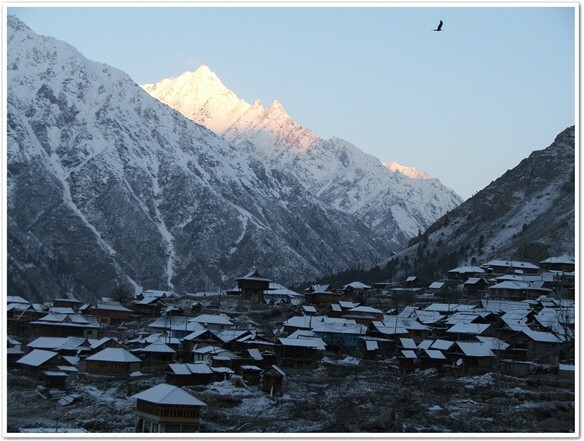 We would halt for the night at Sarahan, midway between Shimla and Chitkul; proceed the next day to Sangla valley and Chitkul, stay overnight; go on to Kalpa the day after, spend the night there and return to Shimla the next day. On paper, it all looked fine. But we had no reservations and little clue as to where we were heading. Achtung Baby? Nope. Blow caution to winds, go with the flow. Give chance a chance!!! Beyond Narkanda we followed the silted waters of Satluj till Rampur, capital of the erstwhile princely state of Bushahr. This was the last place on the circuit where we would find functional ATMs of most major banks. It was hot, humid, sweaty. As soon as we withdrew cash, we were back on the road. At Jeori we doubled back and began the steep climb towards Sarahan. Along the road were numerous apple orchards in full bloom. 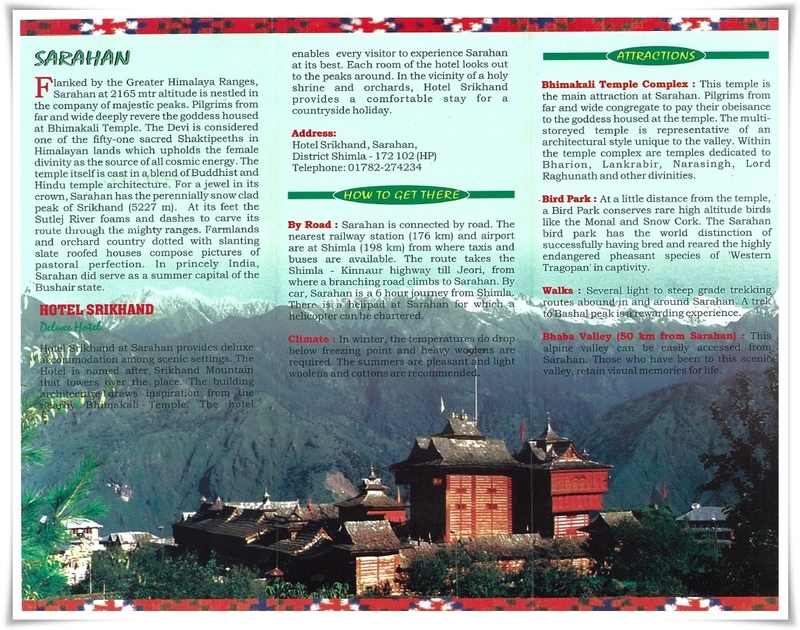 Snow covered peaks towered over the turquoise green landscape dappled with pinkish white apple blossoms. At the HPTDC resort at Sarahan we got a room with a balcony overlooking the Srikhand mountain range. There was a pleasant nip in the air when we went out in the evening. 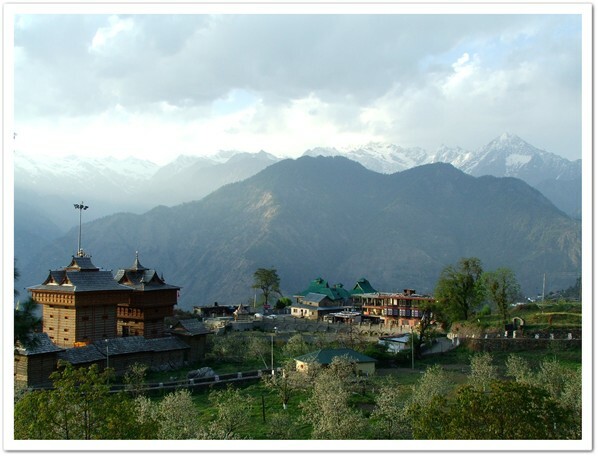 Bhimakali Ji temple dominated the scenery with its intricate woodwork typical of Kinnaur. Inside, we were stripped of camera, watch and all leather (belt, wallet, shoes) before being allowed into the sanctum sanctorum. Thankfully, they allowed us to keep our own skin. A drunkard teetered over the temple entrance; an old lady with an impassive face lost in wrinkles demanded alms and walked away nodding her head when we requested her to pose for a photograph. The Tragopan pheasantry was closed, so we decided to trek to the monastery in the valley. The steep trail that sliced through apple orchards beside a gurgling stream ended near a culvert. An old man, intoxicated, hardly able to support himself, asked us for directions to somewhere. We mumbled an apology and excused ourselves. It was getting dark and we were anxious to get back to the hotel. On the way back, the Mouni Baba (“speechless saint?!!!) at the small saffron coloured shrine of a local deity greeted us with a dazzling smile. This sense of complete unquestioned acceptance was something, as city slickers, we were not familiar with. There was no trace of suspicion or distrust. We were there, he was there, the crimson hued snow peaks were there, there was the gradually advancing night sky, and the apple blossoms, falling, falling, at our feet like snow, and the clean, refreshing air. As the dusk settled over the town a feeling of eternal peace and contentment descended on us. Morning, we woke to the sound of temple chants mingled with the ruckus set up by ravens. They glided, somersaulted and performed a variety of aerial acrobatics over the valley that spread out and beyond our balcony. Across the valley the mountain sides were still under shadow. Wisps of smoke rose from chimneys down below. A handful of people pottered about. Our dinner had been miserable (Chowmein and Thukpa in a filthy Tibetan shack). We made up for it with a sumptuous breakfast of Poori-Sabzi. 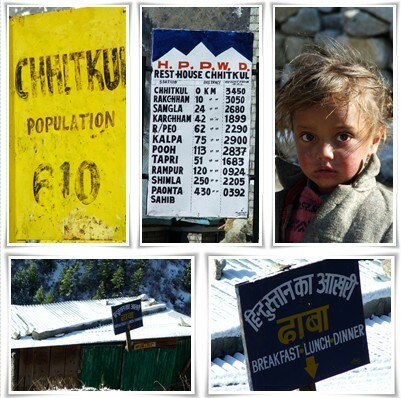 8 AM, as sunlight flooded the valley, we took leave of Sarahan and hit the road to Sangla and Chitkul. HPTDC Volvo bus booking can be done from this website 12 hours prior to departure. Be sure to check out Himachli specialties at the restaurant: Kheroo, Himachli Pulao and the Chef’s special (a wholesome concoction made of mashed potato, corn flakes, fresh milk, coconut and dry fruits). Koya Ram, the restaurant attendant is especially helpful. Amicable, but have great affinity for money. Need to grease his palm for every service rendered. Monosyllabic, conscientious. Occasionally prone to irritability. A man you can trust. Not a soul in sight when we reached Uma Dhaba early evening. A lone waiter took our order immediately, with minimal fuss. Sizzling hot, Masala sprinkled Tandoori chicken was served with mint chutney, thin onion ribbons and half a slice of lemon in clean white plates. Chicken Methi came in a large steel bowl, chunks of chicken submerged below fulvous gravy pock marked with Methi and embellished with a lazy doodle of cream. The dwindling stack of soft, puffy Phulkas on our table was promptly replenished by the attentive waiter. The food was decimated as efficiently as it was served. We rose, paid up, sighed in satisfaction, tipped the waiter and left. No racking of brains over the menu, no hailing of waiters, no mooning over the ambience, no background music, no VAT, no service tax, no nothing – just us and plain good food, and the sacred act of eating, washing up and leaving. I liked that immensely, for a change. As far as Dhabas go, this is a decent one. Purely utilitarian – serves good food sans frills. 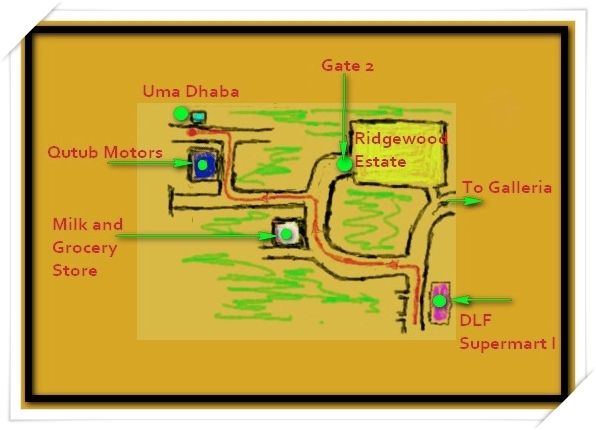 The restaurant is located on a narrow cul-de-sac near Qutub Motors next to Gate-2 of Ridgewood estate, best approached on foot or on a two wheeler. I have included a sketch of the restaurant location, just in case you fancy a visit. Though advertised as a family restaurant, I can’t think of bringing my wife here for dinner; it is strictly meant for bachelor’s staying in the vicinity.